Frida in Focus is an exhibition and series of related events at the Niehoff Urban Studio recognizing and celebrating Frida Kahlo (1907-1954). Frida is one of the most photographed women of her time, a Latin American iconic figure, an internationally known feminist, and an LGBTQ icon. This year’s theme for UC’s Hispanic Heritage Month (HHM), “Do UC me? My voice matters,” is inspired by Frida Kahlo, who determined the world would come to know her through images that were carefully constructed and curated by her. Our hope is that this exhibition and related events shine light on intersectionality, inspire people to imagine how they want the world to view them…and encourage them to make it happen. Frida in Focus has been made possible through the generous support of the UC Office of the Provost, the Office of the Vice President of Research, the Taft Research Center, the UC Office of Diversity & Inclusion, and the McMicken College of Arts & Sciences (A&S). It is a cross-college collaboration between A&S, the College of Design, Architecture, Art, & Planning (DAAP) and UC Libraries. A special thank you to UC professor emeritus Edward B. Silberstein for loaning the extraordinary photographs of Frida and Diego, taken by his father Bernard Silberstein, that have made this exhibition possible. Doctoral student Mar Gámez García will present her recently published play La fauna del poder. A new exhibit has been installed on the 5th floor lobby of Langsam Library in honor of June being LGBT Pride Month. “Bridging Pride to Knowledge” highlights UC Libraries’ resources (books, journals, DVD’s databases, etc.) in LGBTQ subject areas. It includes information on the Stonewall Riots of June 1969 and features notable authors such as Edna St. Vincent Millay, Radclyffe Hall, Oscar Wilde and more. A bibliography is available in print at the exhibit and online. 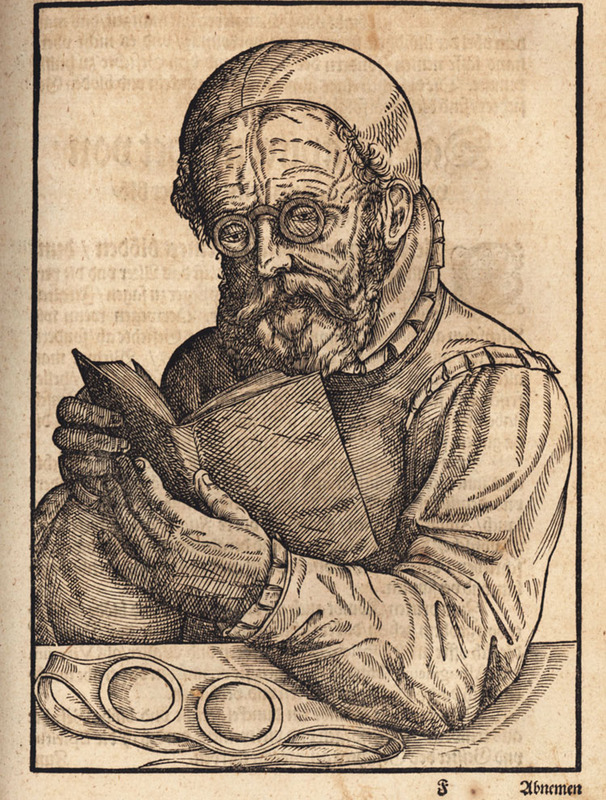 One of the images from the Archives and Rare Books Library collections used in the exhibit. A new exhibit on display on the 5th floor lobby of Langsam Library features original poetry describing historic images from the collections of UC’s Archives and Rare Books Library. UC Libraries received a grant from the Provost’s Office to promote and celebrate diversity throughout the university community. Entitled “Bridges to Diversity and Inclusion” this initiative will provide a school year filled with events, programs and exhibits designed to celebrate diversity on the UC campus and beyond. 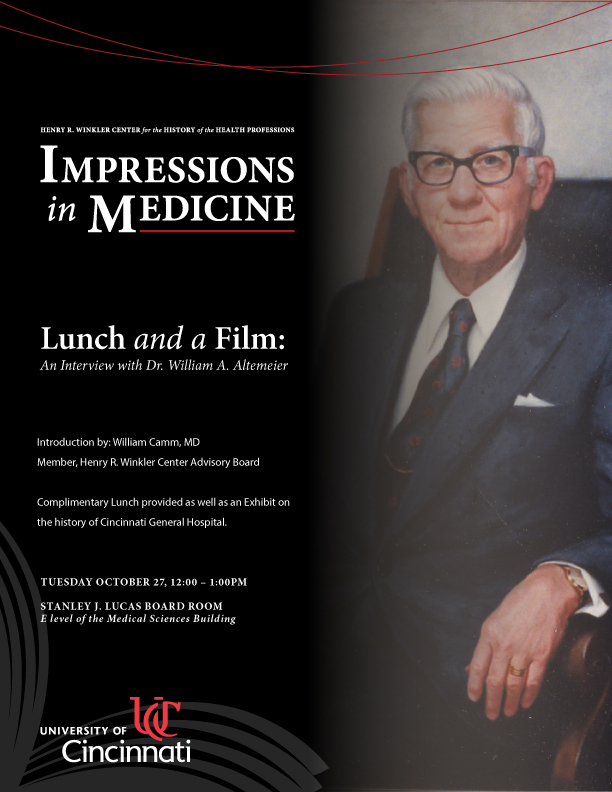 The Henry R. Winkler Center for the History of the Health Professions will be hosting the Impressions in Medicine inaugural event, Lunch and a Film: An Interview with Dr. William A. Altemeier and you are invited. The event will be held from 12:00-1:00 PM on Tuesday, October 27, 2015 in the Stanley J. Lucas Board Room in the Medical Sciences Building (see map below). We’ll be airing excerpts from one of the more significant oral history interviews from our extensive collection with an introduction by Secretary of the Henry R. Winkler Center Advisory Board, Dr. William Camm, along with a complimentary lunch and a viewing of an exhibit on the history of Cincinnati General Hospital. Please feel free to pass this invitation on to anyone you know who may be interested in attending the lecture. In January of 2012, the Public Library of Cincinnati and Hamilton County (PLCH) and the University of Cincinnati Libraries (UCL) began a long-term collaboration to provide conservation and preservation treatments in an equally-managed, staffed and equipped preservation lab located in UC’s Walter C. Langsam Library. Employees from both PLCH and UCL work on the general circulating and rare/special collections of each institution. The division of labor for all work performed by the Preservation Lab is divided evenly between UCL and PLCH and is tracked using a weighted point system. A new exhibit, “Preserving the Past for the Future,” showcases the work done by the Preservation Lab on some rare/special items from both PLCH and UCL. Items in the exhibit range from photo albums to bridge reports to scrapbooks. The exhibit demonstrates both before and after images of the treatment done to the objects and explains the process. The exhibit was curated by Jessica Ebert, conservation technician, and designed by Amanda Jackson, communications co-op design student. The online exhibit was created by Lisa Haitz, web developer. Below is the exhibit in its entirety. The physical exhibit is currently on display on Langsam Library’s 5th floor lobby.